The words in the film are from the North Korean poet Cho Ki-chon‘s epic poem Mt. Paektu written in 1947. The poem relates the (possibly exaggerated?) story of the guerilla fighter Kim Il sung in the 1937 Battle of Pochonbo against the Japanese. The poem compares the heroic “Commander Kim” with the volcanic Paektu Mountain, a continuing metaphor in North Korean propaganda today. 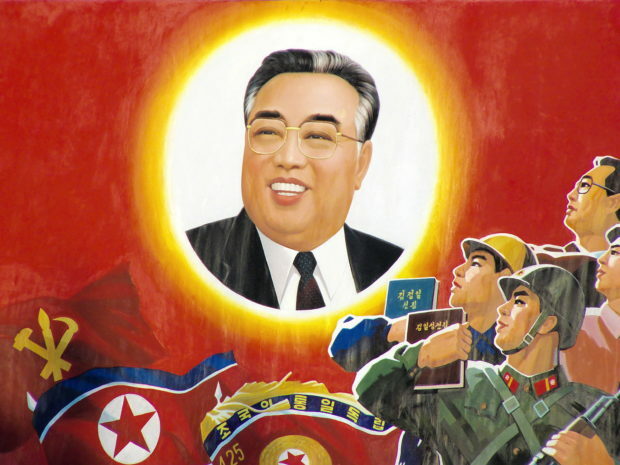 Kim Il-sung was born on April 15, 1912, in Mangyondae, near Pyongyang, Korea, and went on to become a guerrilla fighter against Japanese occupation. Kim also fought with the Soviet army during World War II and returned to his home region to become premier of North Korea, soon setting in motion the Korean War. He was elected country president in 1972, and held the position until his death on July 8, 1994. What does the “-un” and “-il” mean in Kim Jong-un’s and Kim Jong-il’s names? Part of the first Kim’s given name was passed on to the second Kim, and the other part of the second Kim’s given name was passed on to the third Kim.